The Next Generation Program is thrilled to announce the launch of an initiative to share learnings from a series of innovative models of collaboration that aim to bridge theory and practice in the global development sector! This initiative will develop a series of in-depth case studies on the challenges, strategies, business models and successes of these collaborations. The purpose of these independent case studies is to engage and inform leaders within our sector on strategies and best practices on how they could better work collaboratively – and to inform a wider readership by making these studies publicly available. 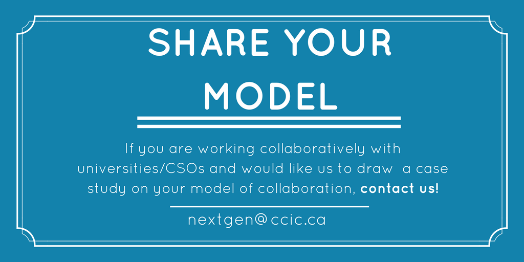 So far, three models of collaborations from different Canadian CSOs have been selected. The Next generation program will launch the first cases in Spring 2018. The cases will provide an in-depth understanding of these models and will share learnings for the sector. Graduate students from various Canadian universities will conduct, design and write the case studies. The Next Generation will identify other innovative models to include in this series over the course of the program.